“Traveler, there is no path / Paths are made by walking.” These verses were written by the poet Antonio Machado yet precisely capture the sensibility of the filmmaker Patrick Wang. Look at his writings and see how Wang strives to wipe the position of the filmmaker clean of the concept of foreknowledge. To Patrick Wang, creation is above all a matter of attempting, fumbling, risking : all in all, searching. 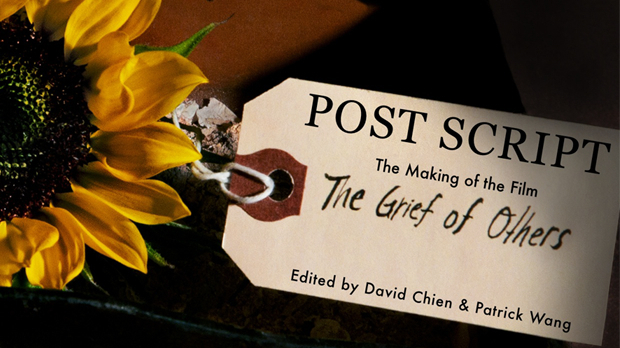 Post Script, the making of the film The Grief of Others is an i-book he wrote together with David Chien in the course of shooting his second feature film The Grief of Others. This book is not by any means to be seen as a mystical process inspired by divine muses. 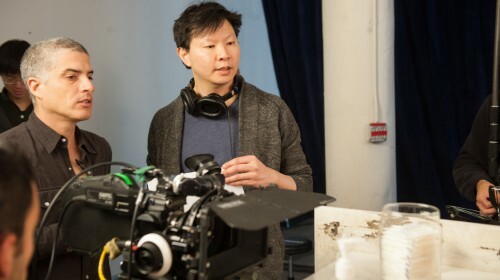 On the contrary, Wang aims, from the interpretation of Leah Hager Cohen’s novel from which the film is adapted, to the color-grading process, to recount, in the most factual and humble way, about the diverse issues a director must address and the joy to be derived in solving them collectively. Here are, with kind permission of Patrick Wang, three excerpts from Post Script. Please click here to access the French translation of these texts. The Grief of Others accompanied me on a flight to Hawaii for the world premiere of my film, In the Family. It was the voice of an old friend travelling with me into the new world of film. Little did I know how many new experiences this novel would bring to me. One of these came in the form of a question. Could this novel be translated into a film? This is Leah’s fourth novel. I have admired all the others, but I saw their form on the page as final. I kept this question to myself for a few months, enough time to open my film in New York and to read the novel a second time. I then shared the thought and began a conversation with Leah as well as her friend and agent, Barney. One of the reasons I have continued to pursue this project is for more occasions to speak with the two of them. Would Leah and I work together on the screenplay? It was Barney who asked the question, but I was wondering the same thing. In the end, I decided to give it a go on my own, and Leah, so very generous with her work, let this happen. A year would pass before I had a draft to share with them. I spent eleven months of that year not writing. Because of the novel’s complex structure, I thought I would have to read and re-read it, but I didn’t do that either. Instead, I spent the time studying novels that had been adapted into multiple films and reading half a dozen books by Alice Munro. I spent eleven months of that year not writing. Studying film adaptations taught me when a bold departure from the source material can be a powerful tool, but far more essential training for writing this screenplay was the study of Munro’s short stories. The density of information she can communicate in so few words is a profound lesson for the screenwriter unwilling to sacrifice a novel’s depth as it is made to assume a more compact form. Munro is also a master of illuminating a life through the use of unusual fractures in time. Studying the master has inspired a unique time structure for this screenplay. When this structure first revealed itself, it was a surprise and a relief. It is one of the things that excites me most about this film. So the first draft landed the structure, and it included some new, original material. The next draft came six months later. The most notable changes here were improvements in dialogue. Having used the novel’s dialogue for many scenes the first time around, my ear for the details of how each character spoke was underdeveloped. Now, another six months later, I have just completed the shooting script. The theme of these changes is fine pruning. It’s hard to put your finger on the differences, but you can feel them. They open up modest, essential spaces so that the film can continue to grow. From this point on, the movie changes, surprises, deepens, is added to, is labored over, even as these pages remain fixed. We are ready to commit our work to film, to say: this is it. These are the performances, the sets, the way we see it all. And I love that this commitment is made within a pressure cooker, with the clock ticking. My temperament is a clumsy fit for daily living, but it is at home on a film set. Within a breath, you are gardener, cook, magician, and mathematician. I find the onslaught of questions a director faces during a shoot lusty babble. Within a breath, you are gardener, cook, magician, and mathematician. You are being quizzed on color and spacial relations and psychology. The easy queries you can swat away, the really fun ones are the ones that baffle you. When these come, I like to make a little space, still the bustle and the buzzing to really consider the thing. Actually, that’s not completely accurate. Some of the things you consider, many of the things you feel your way to the answers. But both need space. Love the chaos but defend a little space for ideas and feelings to grow into inspired decisions. I have no idea what will come of these twelve days. There would be no point in going through them if I did. There is a mythology that invades just about every film shoot in the form of these words: the director’s vision. The idea is that the director has seen the holy land and has returned to take us there. I’m not a fan of this story. It implies that the director’s vision is something whole and known. (You never hear of a director waiting for her vision or referring to the piece of the vision he had today.) It is also contrary to my experience of making incremental progress on a film through constant iterations of imagination. You can hold on to the same principles and goals throughout the process but how exactly you serve those principles in your execution is the question that pops up moment to moment to moment. How a director addresses the question is hard to describe. It may change all of the time. It may look like one thing to the outside world that is very different from a director’s interior experience. For example, talk to some of my crew, and they may indeed repeat the mythology of the prophet, explaining what a detailed and complete vision I had going in, how I knew just what I wanted. Personally, my experience was less like a prophet and more like a monk thrown into an Olympic race. The wonderful photographer Dorothea Lange described her process of taking photos as one of getting lost and then learning how to see. She is so full of feeling and mastery, but she must step away from these things to be able to see what is before her. This receptive state of the artist is everything. I may have an idea, but I will look at the set again and allow myself a moment to not know. Then some guide will present itself. Where we put the frameline changes so much: tension, attention, density, and on and on. 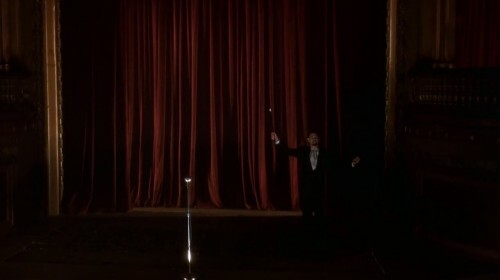 Maybe it’s a piece of the set’s architecture that aligns with the emotion of the scene if we compose it just so. Or some color throws off the balance, so I’ll frame it out. Or the scale of the humans and how to best feel their body language provides the answer. Where we put the frameline changes so much: tension, attention, density, and on and on. I am asked many questions on set, but I ask myself many more. The crew might see me look through the camera, see me move the camera a little, maybe move it a little more, and then say, This is it. My certainty may read to them like the conclusion was obvious. To me, the answer was discovered. I was certain only because I was convinced. I don’t always get it right. I think it is very useful when shooting to recognize, and not bury, decisions that don’t feel right. Then I will change my mind, occasionally leading to a wholesale rejection of a set or a camera approach. But most of the time, the adjustments appear very modest. Bringing the camera in a foot, or lowering it a few inches. Shifting a piece of furniture, losing that plate or that plant, that sweater fabric needs to move differently, the hair is too structured, those lips too red. All throughout pre-production we had been adjusting our designs, but to me these on-set adjustments are different. Seeing all the executed designs next to each other, the adjustments are now geared toward chasing down that elusive beast: balance. Mistakes and dissonances will scream at me, and so I start working to clear away the unintended and unuseful interferences. But the search for balance sometimes require adding interferences. I remember looking at one set that was full and beautiful but bothering me. I realized that it was because the set was too consistently brown, the objects all the same age. It needed small splashes of white and modernity to break up the monolith and find balance. When we design sets, we shoot for a realistic density of details. But when actually shooting the movie, I often find myself subtracting from the set dressing. I walk through the set and just remove objects. Sometimes this is to strengthen a composition as objects can easily interrupt a strong line. Also a realistic level of detail tends to put the actor and the set on equal footing, and I prefer to tip the scales ever so slightly in favor of the actors. And I feel there’s just a little more space for dramatic possibility without too much stuff lying around. But what exactly do you take away? No vision told you. You have to get lost in the scene and learn to see it.